In 2010, BP’s Deepwater Horizon offshore oil rig exploded, killing 11 workers and leaking 4.9 million barrels of oil into the Gulf of Mexico. This disaster has cost BP $55bn, including a $20.8bn fine to the US government: the largest environmental fine in US history. In 2016, BP leaked 95 tonnes of oil into the North Sea – and decided not to clean it up. To add insult to injury, BP no longer pays net taxes for extracting North Sea oil. Instead, the British public is paying BP to drill and spill. BP has propped up and traded with regimes which have been accused of serious human rights violations in Azerbaijan, Algeria, Libya, Indonesia, and other countries. As a major shareholder in the pipeline company Ocensa, it was complicit in allowing a Columbian paramilitary brigade to create a “regime of terror” along the route of the Ocensa pipeline, and in the torture, murder and disappearance of more than 12,000 people in the oil-rich and politically unstable Casanere region of Columbia. BP has invested at least £1.6 billion in tar sands extraction in Alberta, Canada. This has decimated vast swathes of the Canadian landscape, including sacred territories of the Beaver Lake Cree, who are now taking BP to court. BP’s business model itself is clearly unsustainable. We know that humanity can only burn 33% of existing oil reserves without pushing global temperatures higher than 2°C. This is agreed to be the very most we can allow temperatures to rise, in order to keep the worst effects of climate change – starvation, death, displacement and conflict – to an “acceptable” minimum. Yet BP intends to continue expanding its oil extraction activities, causing deadly climate change, whilst lobbying against environmental laws and clean energy alternatives. What’s wrong with BP sponsoring the arts? BP sponsors the arts in order to generate good publicity, which it so desperately needs. Being seen as a partner to our national cultural institutions helps BP present itself as a caring, generous member of the community, whilst continuing to destroy the environment and contribute to human rights abuses around the world. We call this ‘artwash’. And it works. 38% of people who were exposed to BP’s Olympic sponsorship believe that BP is doing better at working towards a cleaner planet. 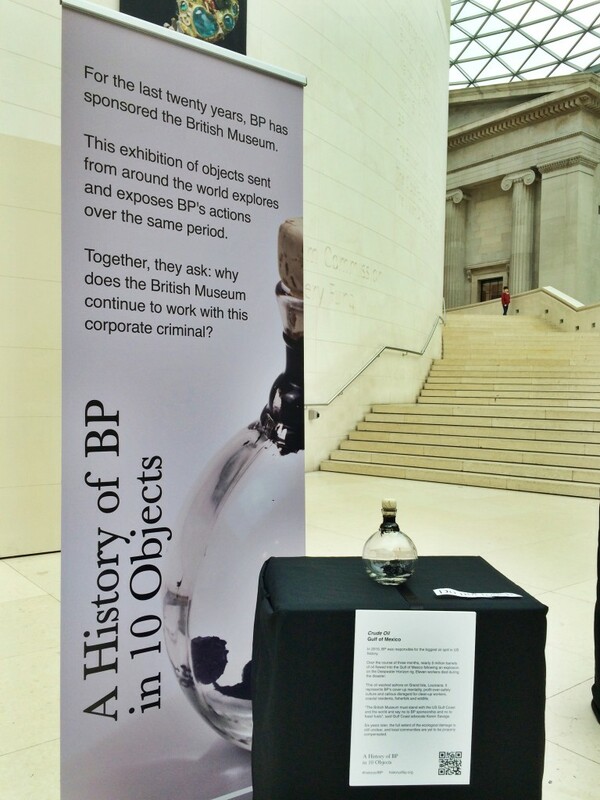 The arts and cultural institutions that accept sponsorship from BP are effectively legitimising BP’s actions, by giving them positive publicity. Oil sponsorship taints the reputation of the arts and cultural institutions that accept it. Art should not be exploited by big oil corporations. In return, the arts institutions only receive a tiny percentage of their annual income from BP. BP sponsorship provides less than 1% of the annual income of the British Museum and the Royal Opera House, and just 2.9% of the income of the National Portrait Gallery. BP needs these institutions far more than they need BP. Raoul Martinez, an artist who has thrice been short-listed for the BP Portrait Awards, has written a thoughtful and powerful piece on this, on pages 23-27 of Picture This – A Portrait of 25 Years of BP Sponsorship. 205 artists and culture-lovers signed an open letter to the National Portrait Gallery against BP’s sponsorship of the award. We recognise that funding for the arts is vital. We believe that oil sponsorship should be replaced by increased government funding for the arts. For one vision of how the arts could be funded without corporate sponsorship, see the PCS Union’s detailed Alternative Vision for Culture. We will work with the Show Culture Some Love campaign to call for greater public investment in arts & culture. Alternatively, if the large cultural institutions do not renew their sponsorship agreements with BP, this would be an opportunity for multiple, more ethical and sustainable businesses to pitch for a joint sponsorship deal. The Scottish Portrait Awards, sponsored by the Scottish Arts Club charitable trust, are a good example of an alternative. While the prize money is, admittedly, substantially less than the BP Portrait Award, it may increase as these new awards develop. The divestment movement is gathering momentum, with universities, churches, city councils and pension funds all starting to break their financial links with fossil fuels. Now our cultural institutions are beginning to do the same: in 2015 the UK’s Science Museum ended its sponsorship deal with Shell, and in 2016 both Tate and the Edinburgh International Festival dropped BP. This didn’t stop the Festival from producing a fantastic and extensive programme of world-leading performance art in August 2016. It’s time for the National Portrait Gallery to cut ties with BP.